Getting around North Bay is easy thanks to the North Bay Public Transit system. 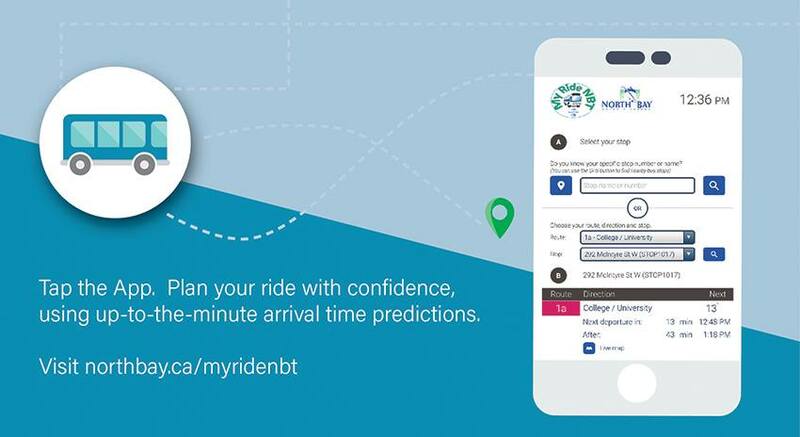 North Bay Transit has launched an easy mobile site to help you find your way around town. Visit northbay.ca/myridenbt. Learn more about North Bay Public Transit here. All Full-Time Canadore students receive a bus pass for unlimited travel throughout the city during months of study. As of September 1, 2010, a North Bay Transit Pass has been included in the tuition costs of all full-time Canadore students. The fee is charged to within student ancillary fees as a result of a student referendum that took place January 2009. Bus passes are effective from September 1 to April 30. The bus pass is incorporated into the student card. Lost cards should be reported to the Admission’s Office as soon as possible so that a replacement card may be produced for a cost of $25. What if I have my own car - can I opt out of the bus pass fee? Students will not be able to opt out of the bus pass fee. In order to ensure the best pricing for all full-time students, all students must be charged this fee. Do I get a discount on a parking pass if I have to pay the bus pass fee? Students will not receive a discount on a parking pass. If I withdraw or am withdrawn for academic reasons from my program, is my bus pass still be valid? The bus pass will not be valid if a student withdraws or is withdrawn from their program and the college. Will I have to carry two cards, one for a student card and one for a bus pass? The student card and bus pass will be combined on one card with an expiration date on the card. If I am a part-time student, am I able to obtain a bus pass? The bus pass is for full-time students only as it is part of a set ancillary fee, however; part-time students are eligible to purchase a transit pass at a reduced student rate when purchased through The City of North Bay. If I don’t want a bus pass, can I get a refund? No, students will not be able to opt out of the bus pass fee. In order to ensure the best pricing for all full-time students, all students will have to pay this mandatory ancillary fee. My course ends after April 30. How am I supposed to get to school? Students in extended programs whose winter semester extends beyond April 30 will receive a combined bus pass and student card that takes the later end date into consideration. This is done at no extra cost to the student. Students studying over the summer months are eligible to purchase a transit pass at a reduced student rate when purchased through The City of North Bay. This summer semester fee is NOT included in tuition. I’m on placement during my last year and I won’t be living in North Bay. Why should I have to pay for a bus pass? The student bus pass fee is levied to all full-time students regardless of placement. In order to ensure the reduced fee all full-time students must pay this fee. Will I be able to claim the cost of the bus pass when I do my taxes? The cost of the bus pass will be included on your T2202 as part of the tuition fees you pay, and therefore, you will claim this fee as you do your tuition fees. What happens if I lose my student card? Can I get a replacement? Where do I go and how much will it cost? Students may receive a reprint from the Admissions Office. Cost for replacement is $25. Following MTCU guidelines, refunds, including bus passes, will be issued for those students who withdraw within the first 10 days of school. Refunds will not be issued after the 10-day period as per MTCU guidelines.